Laundry seems to be taking over my life! With the small (and I mean small) washer dryer combo unit I have, it takes about 6 hours to wash and dry an entire load. Now, an entire load is about 1/4 the size of a load I could do in the states. Because of this, I can do about one load a day when I am working and two loads on my day off. 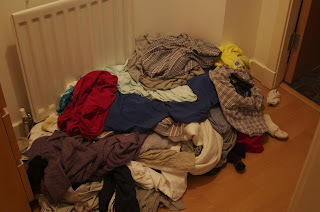 BUT, to make it even worse, washing the sheets takes two loads and the towels take two loads as well. This has become a problem because of the back log of laundry I have...see the picture to understand what I mean by "back log". Now I wonder to myself, "will I ever get caught up on the laundry?" I am beginning to think it is a lost cause! Nice laundry backlog.... i have that too but your are right it will only take me 2 or 3 loads and then im done...and good to go for another 3 or 4 weeks :) Good Luck with that! I'VE SEEN THOSE LAUNDRY MACHINES ON A BBC SHOW "HOW CLEAN IS YOU HOUSE". MAYBE THE HOUSES ARE SO DISGUSTING BECAUSE IT TAKES SO LONG TO DO THINGS WITH THEIR LEVEL OF MODERN MARVELS!